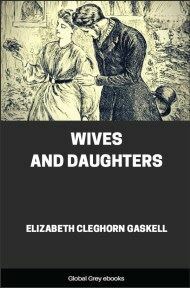 Set in English society before the 1832 Reform Bill, Wives and Daughters centres on the story of youthful Molly Gibson, brought up from childhood by her father. 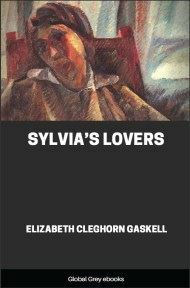 When he remarries, a new step-sister enters Molly's quiet life – loveable, but worldly and troubling, Cynthia. 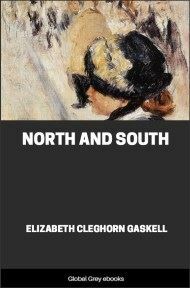 The narrative traces the development of the two girls into womanhood within the gossiping and watchful society of Hollingford. 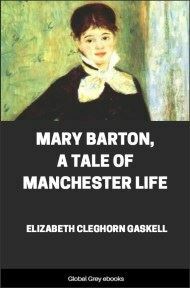 When Elizabeth Cleghorn Gaskell died suddenly in 1865, the novel was not quite complete, and after chapter 60, there is a 'Concluding Remark' section by the editor of the Cornhill Magazine, in which the novel was serialised. To begin with the old rigmarole of childhood. In a country there was a shire, and in that shire there was a town, and in that town there was a house, and in that house there was a room, and in that room there was a bed, and in that bed there lay a little girl; wide awake and longing to get up, but not daring to do so for fear of the unseen power in the next room—a certain Betty, whose slumbers must not be disturbed until six o'clock struck, when she wakened of herself "as sure as clockwork," and left the household very little peace afterwards. It was a June morning, and early as it was, the room was full of sunny warmth and light. On the drawers opposite to the little white dimity bed in which Molly Gibson lay, was a primitive kind of bonnet-stand on which was hung a bonnet, carefully covered over from any chance of dust with a large cotton handkerchief, of so heavy and serviceable a texture that if the thing underneath it had been a flimsy fabric of gauze and lace and flowers, it would have been altogether "scomfished" (again to quote from Betty's vocabulary). But the bonnet was made of solid straw, and its only trimming was a plain white ribbon put over the crown, and forming the strings. Still, there was a neat little quilling inside, every plait of which Molly knew, for had she not made it herself the evening before, with infinite pains? and was there not a little blue bow in this quilling, the very first bit of such finery Molly had ever had the prospect of wearing? Six o'clock now! the pleasant, brisk ringing of the church bells told that; calling every one to their daily work, as they had done for hundreds of years. Up jumped Molly, and ran with her bare little feet across the room, and lifted off the handkerchief and saw once again the bonnet; the pledge of the gay bright day to come. Then to the window, and after some tugging she opened the casement, and let in the sweet morning air. The dew was already off the flowers in the garden below, but still rising from the long hay-grass in the meadows directly beyond. 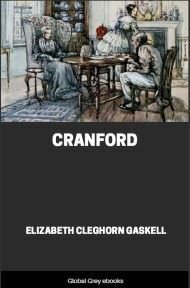 At one side lay the little town of Hollingford, into a street of which Mr. Gibson's front door opened; and delicate columns, and little puffs of smoke were already beginning to rise from many a cottage chimney where some housewife was already up, and preparing breakfast for the bread-winner of the family. Molly Gibson saw all this, but all she thought about it was, "Oh! it will be a fine day! I was afraid it never, never would come; or that, if it ever came, it would be a rainy day!" 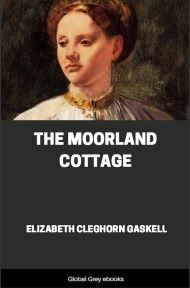 Five-and-forty years ago, children's pleasures in a country town were very simple, and Molly had lived for twelve long years without the occurrence of any event so great as that which was now impending. Poor child! 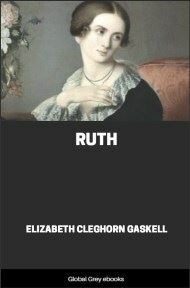 it is true that she had lost her mother, which was a jar to the whole tenour of her life; but that was hardly an event in the sense referred to; and besides, she had been too young to be conscious of it at the time. The pleasure she was looking forward to to-day was her first share in a kind of annual festival in Hollingford. The little straggling town faded away into country on one side close to the entrance-lodge of a great park, where lived my Lord and Lady Cumnor: "the earl" and "the countess," as they were always called by the inhabitants of the town; where a very pretty amount of feudal feeling still lingered, and showed itself in a number of simple ways, droll enough to look back upon, but serious matters of importance at the time. It was before the passing of the Reform Bill, but a good deal of liberal talk took place occasionally between two or three of the more enlightened freeholders living in Hollingford; and there was a great Tory family in the county who, from time to time, came forward and contested the election with the rival Whig family of Cumnor. One would have thought that the above-mentioned liberal-talking inhabitants would have, at least, admitted the possibility of their voting for the Hely-Harrison, and thus trying to vindicate their independence. But no such thing. "The earl" was lord of the manor, and owner of much of the land on which Hollingford was built; he and his household were fed, and doctored, and, to a certain measure, clothed by the good people of the town; their fathers' grandfathers had always voted for the eldest son of Cumnor Towers, and following in the ancestral track, every man-jack in the place gave his vote to the liege lord, totally irrespective of such chimeras as political opinion. This was no unusual instance of the influence of the great land-owners over humbler neighbours in those days before railways, and it was well for a place where the powerful family, who thus overshadowed it, were of so respectable a character as the Cumnors. They expected to be submitted to, and obeyed; the simple worship of the townspeople was accepted by the earl and countess as a right; and they would have stood still in amazement, and with a horrid memory of the French sansculottes who were the bugbears of their youth, had any inhabitant of Hollingford ventured to set his will or opinions in opposition to those of the earl. But, yielded all that obeisance, they did a good deal for the town, and were generally condescending, and often thoughtful and kind in their treatment of their vassals. Lord Cumnor was a forbearing landlord; putting his steward a little on one side sometimes, and taking the reins into his own hands now and then, much to the annoyance of the agent, who was, in fact, too rich and independent to care greatly for preserving a post where his decisions might any day be overturned by my lord's taking a fancy to go "pottering" (as the agent irreverently expressed it in the sanctuary of his own home), which, being interpreted, meant that occasionally the earl asked his own questions of his own tenants, and used his own eyes and ears in the management of the smaller details of his property. But his tenants liked my lord all the better for this habit of his. Lord Cumnor had certainly a little time for gossip, which he contrived to combine with the failing of personal intervention between the old land-steward and the tenantry. But, then, the countess made up by her unapproachable dignity for this weakness of the earl's. Once a year she was condescending.